Freshman center Collin Smith plays in a 2016 game against Bowie State in the Smith Center. Freshman center Collin Smith is expected to transfer, according to a tweet by sports reporter Ben Standig. Smith is the fifth player to leave the program in the offseason. GW tweet: F Collin Smith expected to transfer, according to sources. 6-foot-10 forward impressed at times during his freshman season. Smith’s transfer adds to the list of players who will not be returning to the Smith Center next season, including sophomore Collin Goss, sophomore Jordan Roland and freshman Kevin Marfo, who announced earlier this year they would transfer next season. 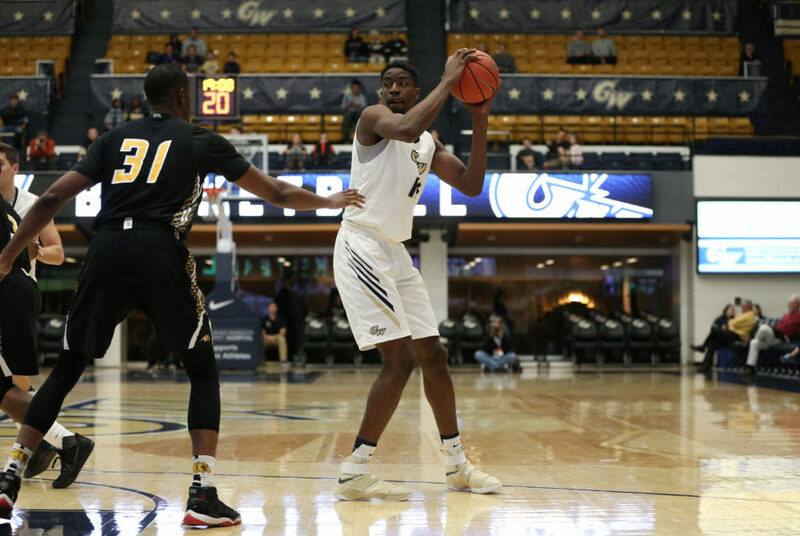 Redshirt junior Jaren Sina will also not be returning to GW after he graduates and instead plans to play professionally in Europe. Smith started in 17 of the 34 games he saw action in as a rookie and ranked third on the team in rebounds per game (4.4) and second in blocks (29). The 6-foot-10 center averaged 5.3 points per game and shot 46.7 percent from the field. The Colonials are now set to return just six players from last season, in addition to the four new recruits and one transfer who will be joining GW in the fall.